West Bengal Housing Board initiated two group housing models for catering to the increased demand of affordable housing amongst low-income and middle-income groups. A sole government venture and a joint venture under Public–Private Partnership (PPP). Hence assessing the satisfaction level of group housing residents “with cost” incurred is crucial in making policy decisions. The present study focuses on MIG owing to the challenging housing requirement of this group based on sociological and financial constraints. Selecting MIG group housings from Kolkata, India, satisfaction level was assessed at three discrete domains -“within premises”, “at neighbourhood” and “with cost” incurred and holistically by evaluating overall level of satisfaction “with location”. Measuring this phenomenon developing a Composite Satisfaction Index (CSI) as a weighted average is also intended in this paper. Primary survey was conducted using structured questionnaires and data were collected on a five-point Likert scale. Data being ordinal in nature a two step approach was adopted: initially through exploratory factor analysis contributing attributes were identified and later a Generalised Ordered Logit Model was fitted in STATA. 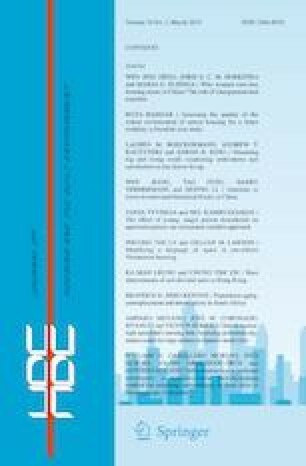 Mean satisfaction scores were computed and validated with savings calculated as a difference of actual expenditure and recommended expenditure towards housing. Attribute “with cost” contributed significantly towards overall level of satisfaction “with location” in both the models. Higher income leading to high affordability, high satisfaction domain wise led to high satisfaction level and CSI for the PPP residents. Lower income leading to low affordability, moderate satisfaction domain wise led to moderate satisfaction level and CSI for the residents of government group housings. Computed CSI values complied with overall findings indicating the reliability of the index in similar contexts. Affordability variations hamper the successful outreach of implemented government policies to the intended beneficiaries hinting at a need for policy revision. Taherdoost, H., Sahibuddin, S., & Jalaliyoon, N. (2014). Exploratory factor analysis; concepts and theory. Advances in Applied and Pure Mathematics (pp. 375–382). ISBN: 978-960-474-380-3. https://www.semanticscholar.org/paper/Exploratory-Factor-Analysis-%3B-Concepts-and-Theory-Taherdoost-Sahibuddin/1bd8bbd66524ccf605c879982cd35ef3a3d52160. Williams, R. (2005). Gologit2: A program for generalized logistic regression/partial proportional odds models for ordinal dependent variables. https://www.stata.com/meeting/4nasug/gologit2.pdf.